The hands-on career events are geared for students ages 15 and up, and supports local schools providing career and technical education programs. Lift & Move USA is organized by SC&RA, SC&R Foundation, NCCCO and KHL Group. "We will bring this authentic career exploration event to some new regions and return to areas with particularly high labor demand," said Tracy Bennett, Director of Lift & Move USA. "For the first time since the event launched, we will visit north central New York and Ontario, Canada—near the southern and northern shores of Lake Ontario. In addition, we return to Texas with one event in Houston and one in Longview," she said. As part of the programming for our Lift & Move USA event, we're excited to partner with local businesses to provide mock interview exercises as an authentic learning experience. Students will have the opportunity to speed interview with an HR or staffing professional and will leave with constructive feedback on best practices." May 9, 2019 in Webster, NY, is hosted by Boulter Industrial Contractors and will feature equipment from Clark Rigging & Rental and Silk Road Specialized Transport. In addition to learning about technical skills specific to industrial contracting, Boulter Industrial Contractors will give students to experience practical interviewing skills. "In the age of social media, many young adults lack interpersonal skills and confidence when interviewing. As part of the programming for our Lift & Move USA event, we're excited to partner with local businesses to provide mock interview exercises as an authentic learning experience. Students will have the opportunity to speed interview with an HR or staffing professional and will leave with constructive feedback on best practices," said Brittany Bachman, Marketing Manager. "Popular shows like ‘How It's Made,' represent only a small part of the industrial sector. It's time to show the next generation of workers how the industrial machines they were watching were installed in factories." 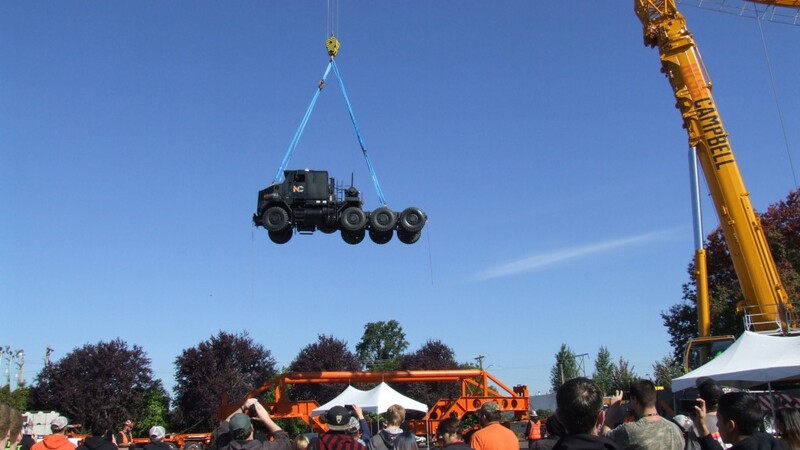 May 30, 2019 in Vaughan, Ontario, Canada, is hosted by Matcom and will feature equipment from Anderson Haulage and Ontario-based crane rental firms. "Popular shows like ‘How It's Made,' represent only a small part of the industrial sector. It's time to show the next generation of workers how the industrial machines they were watching were installed in factories. With the help of Lift & Move, Matcom and its partners will deliver a peek inside the world of rigging, heavy hauling, and cranes. Students will learn that this industry is the backbone of the industrial sector, and how these services impact their daily lives," said Matt Rix, President of Matcom. October 16, 2019 in Longview, Texas, will be hosted by BOSS Crane & Rigging and Bennett International Group. November 7, 2019, in Houston, Texas, will be hosted by Liebherr. Key to the success of the program is that students see live equipment demonstrations and hear personal stories from company employees about their own career trajectories as the students rotate through multiple learning stations. Nearly three-fourths of students responding to recent post event surveys are at least moderately likely to consider careers related to this industry after attending an event. Meanwhile, all teacher respondents say they will recommend careers in transportation, crane and rigging to future students. Key to the success of the program is that students see live equipment demonstrations and hear personal stories from company employees about their own career trajectories as the students rotate through multiple learning stations. Some of the most popular learning stations include simulators, such as the Vortex crane simulator provided by CM Labs, a chain falls Minute to Win It style competition, and the chance to climb into the cab of trucks and cranes. "There is real interest by teachers to help young people understand the career path into our industry. Teachers were pleased that the message they work so tirelessly to promote was validated through the interactive stations and real-life skills demonstrated by our employees," said Brian Schleicher, Director of Marketing & Communications for Superior Cranes Inc., which hosted an event last November in Rockingham, N.C.